Combustible dusts are any combustible solid material composed of distinct particles or pieces, regardless of shape, size or chemical composition that presents a fire or deflagration (explosion) hazard when suspended in air. The National Fire Protection Association (NFPA) states that any material that will burn in air as a solid can be explosive in a finely-divided form, and any industrial process that reduces materials into small particles presents a potential for a serious fire or explosion. Keep in mind, however, that many dusts may not appear on this list, yet still present significant explosion hazards. Referring to a material’s Safety Data Sheet (SDS) can be helpful, but may not definitively establish the combustible danger of a dust. Numerous variables such as particle size, shape, and moisture content will significantly contribute to its explosibility. To determine a dust’s explosive capacity, then, appropriate testing must be performed. For more information on testing dusts to classify them as “combustible” or “non-combustible”, please refer to the Risk Management section. Where are Combustible Dusts found? While certain industries are more obviously affected by combustible dusts than others, the presence and danger of such dusts are not limited to these specialized types of industries. Essentially, ANY facility that processes or produces combustible materials or their byproducts in a finely-powdered form has a work environment that may present a serious combustible dust hazard. The OSHA enforcement program which is currently in effect (the National Emphasis Program, or NEP) identifies industry categories that have the potential for more frequent or catastrophic combustible dust explosions and those that have the potential for such explosions based on past events. It is estimated that some 426,000 facilities fall into these industrial categories targeted by the NEP. BEWARE: If your industry is not on the list, it DOES NOT mean you may not have combustible dust. We recommend everyone make an independent determination of the dust hazards at your facility, whether or not your industry is listed in the NEP. 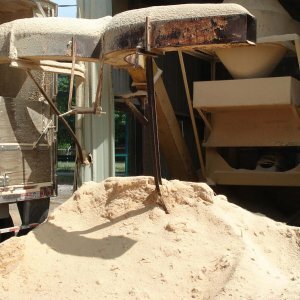 OSHA is currently developing a specific combustible dust standard, and many stakeholders are calling for this standard to apply to any facility that generates, processes or handles combustible dust, instead a singling out specific industries. A number of industries not identified in the NEP also have combustible dust hazards, therefore, the new standard will not likely include any facility that processes, generates, or handles combustible dusts. The most important step that all industrial facilities can take right now is to determine if the dusts they generate or handle are combustible. Independent testing by licensed laboratories may be necessary to make this determination. If a facility deems that the dusts generated are combustible, the next step is to perform a combustible dust hazard analysis to determine the facility’s compliance with OSHA’s NEP and the various NFPA standards that apply to each individual facility. Professional engineering consultants are available to assist facilities with this evaluation. For further information on evaluation and response actions, and the help that is available in performing such tasks, please refer to the Risk Management section. Are Combustible Dust Fires Dangerous? A great deal of the discussions about combustible dust focus on Combustible Dust Explosions. However, over 80% of combustible dust events are fires that do not result in headline-making explosions. Despite this, the one thing to consider is that all major combustible dust explosion events have had one thing in common … the facility where the event occurred had a history of combustible dust fires before the major explosion occurred. Because of this, any facility that has experienced dust fires before should conduct a full dust hazard analysis to determine how vulnerable its employees and processes are to combustible dust fires and explosions. How does a dust explosion occur? What are the dangers of combustible dust? A dust explosion will occur when all five of these factors are present. When combustible dust in a container, room or piece of equipment becomes suspended in the air, even a small spark can create a dust explosion. This is known as the primary explosion. The primary explosion is often relatively small and weak. The primary explosion is often followed by a secondary explosion. Dust that has accumulated on floors, in ductwork, on equipment, etc. at the facility becomes disturbed by the pressure wave generated by the initial explosion, and this newly-suspended dust ignites and a secondary explosion occurs. Example of Baghouse Explosion and Deflagration PropogationThe domino effect can continue, as the blast wave from the secondary explosion can cause more dust to become suspended in the air, creating further dust explosions. It has been determined that an average of 1/32 inch buildup of dust throughout a building, greatly increases the likelihood of a secondary explosion. All surfaces within the room, including equipment, piping, and rafters, are included in this determination. OSHA guidance requires that dust accumulation cannot exceed 1/32 inch on any surfaces equaling 5% of the floor area in the room. 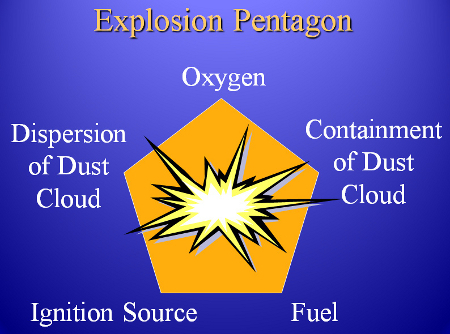 Since all five factors of the “Dust Explosion Pentagon” must be present for a dust explosion to occur, eliminating the factors that can be controlled, dust accumulation and ignition sources, is essential to protecting a facility and its workers. Professional consulting firms, such as Conversion Technology, Inc., have the experience to evaluate industrial facilities for combustible dust hazards and develop solutions to eliminate the hazards. For more detailed information on eliminating combustible dust hazards and implementing proper work practices, please refer to the risk management section. The range of industries covered in the NEP is very broad, including: agriculture, chemicals, food products, textiles, forest and furniture products, wastewater treatment, metal processing, tire and rubber manufacturing plants, paper products, pharmaceuticals, recycling operations (metal, paper, and plastic), and coal dust in coal handling/processing facilities. The NEP is already in effect. It establishes specific inspection protocols for OSHA inspectors to ensure that inspections are thorough and uniform. Inspectors are specifically looking for any “red flags,” such as a history of fires, any MSDS information indicating combustibility of dust, and dangerous dust accumulations at the facility. Inspectors are also collecting and testing dust samples from potential danger areas at the facility (high spaces, equipment/floors, interior of dust collectors, ductwork, etc.). Fines totaling in the millions of dollars have already been issued by OSHA, with nearly 4,000 violations issued during over 800 inspections in the first year of the NEP’s enforcement. Contact Conversion Technology, Inc. if you would like an estimate to conduct an OSHA NEP compliance assessment. NFPA does not enforce these standards; however, portions of these standards are being used by OSHA as a basis in the current development of the combustible dust standard. For further information on how these standards may apply to your facility, or to request an NFPA compliance review, feel free to contact the engineers at Conversion Technology, Inc., a consulting firm specializing in combustible dust regulations, assessments, and response. REGULATORY ALERT: NFPA 652 Issued – Click for more information. OSHA took a major step towards the creation of a combustible dust regulatory standard in October 2009 with the issuance of an Advanced Notice of Proposed Rulemaking (ANPR). This ANPR announced that OSHA is developing a standard that will address the fire and deflagration hazards of combustible dust. The ANPR identified a number of NAICS codes as susceptible to combustible dust hazards, placing 426,000 facilities and 16 million workers in the affected category. The attached chart shows the potentially far reaching effects of the OSHA standard. OSHA held stakeholder meetings in December 2009, February 2010, and April 2010, and a virtual stakeholder meeting June 2010 seeking comments and information for the standard. The next required step is to convene a Small Business Regulatory Enforcement Fairness Act (SBREFA) panel. This panel has been delayed numerous times since 2011, causing OSHA to downgrade the standard from “Pre-Rule stage” to “Long-term action” in November 2014. However, in May 2015, OSHA upgraded the standard back to “Pre-Rule stage” with a proposed SBREFA panel date of February 2016. Several states have responded with regulations regarding combustible dusts. The California division of Occupational Safety and Health, better known as Cal/OSHA, has enacted rules governing the control of ignition sources, including static electricity, in areas that pose a combustible dust hazard. The rules also regulate cleaning practices and require explosion protection for all pieces of equipment that handle combustible dusts. The NFPA standards that govern the processing and production of combustible metals are officially adopted into the Cal/OSHA regulations as well. In 2010, Georgia also enacted regulations concerning combustible dusts as well. Several NFPA standards have been officially adopted. In addition, the regulation has specific employee training requirements as well as monthly hazard notification. There are specific requirements for written fire protection and emergency action plans that include the formation of an emergency response team that oversees quarterly emergency drills and annual evacuation drills. Combustible dust hazards and regulations are not unique to the United States. Internationally, industries and regulatory agencies have identified the dangers associated with combustible dusts as warranting significant attention. ATEX is one such expression of international concern with combustible dust. An abbreviation for “Atmosphère Explosibles,” ATEX is a set of directives in the European Union designed to eliminate hazards in potentially explosive environments. ATEX is very similar to the purposes of and the measures recommended in the NFPA standards in the United States. Two separate directives comprise the requirements of ATEX for companies. The first (ATEX 137 or the ATEX Workplace Directive) provides standards for improving the health and safety protection of workers at risk in explosive atmospheres. The second (ATEX 95 or the ATEX Equipment Directive) concerns equipment and protective systems intended for use in potentially explosive atmospheres. All electrical and mechanical equipment that is used in potentially explosive environments must demonstrate ATEX certification. All workers in these environments must be protected as well. As of July 2003, products without ATEX certification are considered illegal in the European marketplace. ATEX minimizes the risk of explosion in hazardous areas by requiring manufacturers to consider every possible ignition source, every possibly hazardous environment in which the product could operate, and the technical abilities of people using process equipment. In some cases, simple work practices are sufficient to protect a facility – for example, maintaining high housekeeping standards to prevent dusts from accumulating at the facility, which greatly reduces the likelihood and severity of dangerous secondary explosions. In most cases, however, more detailed additional measures are needed. An essential first step for every industrial facility is to determine the explosive nature of any dusts on-site. The NFPA establishes that “any material that will burn in air” in a solid form can be explosive when in a finely divided form. Safety Data Sheets (SDS) are sometimes sufficient for providing information on the combustibility of a material. But, according to a study performed by the U.S. Chemical Safety Board, a high percentage of MSDS either do not warn of explosion hazards or do not do so clearly and explicitly. Therefore, analytical testing may be necessary to conclusively establish whether a dust is combustible or not. In order to obtain meaningful test results, it is critical to select and obtain proper dust samples. Contact Conversion Technology, Inc. for guidance through the initial phases of a dust hazard assessment. A detailed combustible dust hazard analysis can be instrumental in reducing the risk of a dust explosion. A Combustible Dust Hazard Analysis is a systematic analytical study of a facility and its processes to identify combustible dust hazards to employees, property, and the public at large. 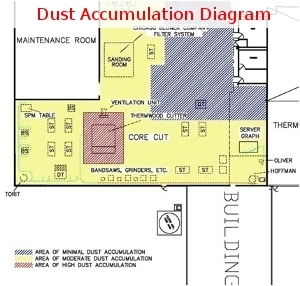 Aspects of a facilities operation, such as individual pieces of process equipment, ducts and dust collection system, are examined individually and aggregately to determine any additional administrative or engineering safeguards that should be implemented to reduce the risk of a combustible dust event. Potential ignition sources are studied and methods to eliminate or reduce possible ignition of a dust cloud are examined. Areas that are deemed to be hazardous locations according to NFPA standards are identified to determine what level of rated electrical equipment is necessary to prevent ignition of a dust cloud. Contact Conversion Technology, Inc. if you would like an estimate to conduct a Combustible Dust Hazard Analysis based on NFPA standards that may apply to your facility. Locations inside a facility are classified based on the characteristics of the combustible dusts present and the likelihood that a hazardous concentration of dust will exist. Areas that are hazardous due to the presence of combustible dusts are referred to as Class II locations. Class II locations are further divided into Division 1 and Division 2. According to NFPA 70, National Electric Code, Article 500, a Class II, Division 1 area is one in which a combustible dust is suspended in the air in sufficient quantities to produce a deflagration under normal operating conditions or where a mechanical failure could produce a dust cloud capable of supporting a deflagration and the failure is also capable of providing an ignition source for the dust cloud. A Class II, Division 2 location is one in which a combustible dust may be suspended in the air in sufficient quantities to produce a deflagration under abnormal operating conditions or where combustible dust accumulations are present and could, as a result of mechanical malfunctions of handling or process equipment, become suspended in the air or where combustible dust accumulations in, on or around electrical equipment could potentially interfere with the safe dissipation of heat or could be ignitable by abnormal operation or failure of the electrical equipment. Class II, Division 1 locations must be equipped with electrical equipment that is dust ignitionproof. This type of equipment is enclosed in such a manner that prevents the entry of dust into the enclosure and does not allow arcs, sparks or heat generated inside the enclosure to leave the enclosure and possibly ignite dust on or around the enclosure. Class II, Division 2 locations must be equipped with electrical equipment that is dusttight. This type of equipment is enclosed in such a way as to prevent the entry of dust into the enclosure. An alternative to the Class/Division classification is the Zone classification method outlined in ATEX 95, Equipment Directive. Locations that are hazardous due to the presence of combustible dusts or ignitable fibers or flyings are classified as Zone 20, 21 or 22 according to NFPA 70, Article 506. A Zone 20 location is one where combustible dusts are present in sufficient quantities to be hazardous either continuously or for long periods of time. A Zone 21 location is one where combustible dusts are likely to occasionally exist under normal operating conditions in quantities sufficient to be hazardous. A Zone 22 location is one where combustible dusts are not likely to exist in hazardous quantities under normal operation and, if they do occur, will only exist for a short period of time. Zone 20 locations must be equipped with electrical equipment that does not permit dust to enter the equipment and does not allow arcs, sparks or heat to ignite dust on or around the equipment. Zone 21 locations must be equipped with electrical equipment that does not allow dust to enter the enclosure and does not allow the surface to become hot enough to ignite a dust layer or cloud. Zone 22 locations must be equipped with electrical equipment that is dusttight. Each room, area or section of a facility is classified individually based on the specific environment. A single room can have multiple areas with differing classification requirements. Facilities must maintain drawings that show the hazardous (classified) locations. Conversion Technology’s engineers can identify the classified locations at your facility and develop the required drawings. There are two basic types of preventative measures, administrative measures and engineering controls. Administrative procedures include detailed housekeeping, hot work and lockout/tagout procedures that address the hazards of performing maintenance work in areas where combustible dusts are present. Proactive housekeeping practices, coupled with routine inspections of equipment and dust accumulation levels, can greatly reduce the hazard level in a facility. Vigilant maintenance of equipment with an emphasis on fugitive dust emissions can dramatically reduce the dust accumulation levels, and thus the hazard level, in a facility. Employers must also inform workers of the hazards associated with combustible dusts present, as outlined in OSHA’s Hazard Communication requirements. Engineering controls include the technical equipment necessary to prevent a deflagration from spreading to occupied areas and/or safely extinguish or vent the deflagration before structural failure of equipment or buildings. 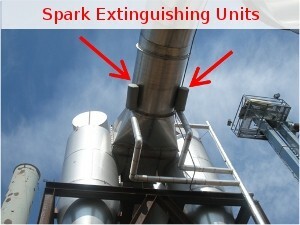 Spark detection and suppression systems are used in ductwork to extinguish sparks or burning embers before they reach cyclones or dust collectors which may contain sufficient airborne dust concentrations to cause a deflagration or explosion. 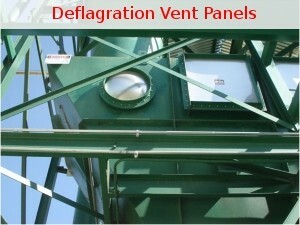 If a deflagration does form inside a piece of equipment, deflagration suppression and venting systems are designed to either extinguish or vent the pressure of the deflagration before the equipment fails and an explosion is allowed to propagate through the building. Isolation devices (active and passive) are used to prevent a deflagration inside a dust collector from spreading through the ductwork to other areas of the facility. 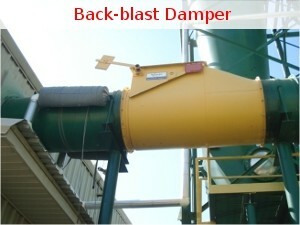 There are a number of vendors that offer explosion protection systems. To ensure that you get the right equipment for your needs, it is recommended that you seek the advice of a knowledgeable consultant. NFPA 654, Standard for the Prevention of Fires and Dust Explosions from the Manufacturing, Processing, and Handling of Combustible Particulate Solids, mandates that operating and maintenance procedures must address personal protective equipment (PPE) including flame-resistant garments in accordance with the workplace hazard assessment required by NFPA 2113. This is due to the specific hazards of a flash fire. Flash fires burn extremely fast, usually lasting less than three (3) seconds. Non-flame resistant garments can be ignited by the flash fire and continue to burn after the initial fire has burned out. The body area beneath non-flame resistant clothing is often burned more severely than exposed skin. The survival rate of personnel exposed to a flash fire drops significantly as the percentage of the total body area affected increases. Flame resistant clothing can drastically reduce the effect of a flash fire. Personnel that operate in dusty environments may also need to wear conductive footwear and grounding straps to prevent the buildup of static electricity. Contact Conversion Technology, Inc. for assistance in determining what level of PPE is required for your workers. The greatest hazard associated with combustible dust comes from the threat of secondary explosions. Secondary explosions occur when a primary explosion, often inside process equipment or in an isolated area, sends pressure waves through a facility that dislodges fine dust that has accumulated on floors, walls, and overhead surfaces. This fine dust then forms a cloud that spreads into a large area. If this dust cloud is ignited, a large, potentially devastating flash fire or explosion could occur. NFPA guidelines and the OSHA NEP state that a dust layer 1/32 inch (0.79 mm) thick spread over just 5% of the floor area of a facility is sufficient to pose a combustible dust hazard. Dust that settles on rafters and piping above the floor can account for covering as much as 10% of the floor area of a building. Cleaning these overhead and relatively inaccessible areas can be difficult and even dangerous. Instead of removing accumulations of combustible dust, preventing the escape of fugitive dust from process equipment is the safest, most effective method of reducing the risk of a combustible dust explosion. If you would like assistance with reducing the dust accumulations in your facility, please feel free to contact Conversion Technology, Inc.
Class II dust: A combustible particulate solid that has an Explosion Severity (ES) greater than 0.5 or an Ignition Sensitivity (IS) greater than 0.2. A Class II dust is an appreciable explosion hazard requiring electrical equipment suitable for Class II locations. Deflagration: Propagation of a combustion zone at a velocity that is less than the speed of sound in the unreacted medium. The dust deflagration index is used to compare the severity of deflagrations caused by different combustible dusts. The value for Kst is used in the St Class system to categorize dusts according to the relative violence of their deflagrations. 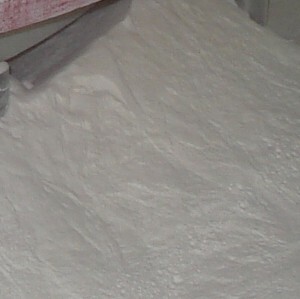 Dust-ignitionproof: Equipment enclosed in a manner that excludes dusts and does not permit arcs, sparks, or heat otherwise generated or liberated inside of the enclosure to cause ignition of exterior accumulations or atmospheric suspensions of a specified dust on or in the vicinity of the enclosure. Dusttight: Enclosures constructed so that dust will not enter the enclosure under specified test conditions. Electrostatic Charging Tendency (ECT): The tendency of a material, based on how strongly the material resists the flow of electric current, to accumulate an electric (static) charge. Explosion: The bursting or rupture of an enclosure or a container due to the development of internal pressure from a deflagration. Hybrid mixture: An explosible heterogeneous mixture, comprising gas with suspended solid or liquid particulates, in which the total flammable gas concentration is >10 percent of the lower flammable limit (LFL) and the total suspended particulate concentration is >10 percent of the minimum explosible concentration (MEC). Limiting Oxygen Concentration (LOC): Maximum oxygen concentration in a mixture of a flammable substance and air and an inert gas, in which an explosion will not occur, determined under specified test conditions. Maximum explosion pressure (Pmax): The maximum pressure achieved by a deflagration under standard testing conditions. Maximum rate of pressure rise ((dP/dt)max): The maximum rate of change in pressure during a deflagration. Minimum Explosible Concentration (MEC): Minimum concentration of dust suspended in air, measured in mass per unit volume, which will support a deflagration. Minimum Ignition Energy (MIE): The lowest capacitive spark energy capable of igniting the most ignition-sensitive concentration of a flammable vapor-air mixture or a combustible dust-air mixture as determined by a standard test procedure. Minimum Ignition Temperature (MIT): Lowest temperature of a hot surface on which the most ignitable mixture of the dust with air is ignited under specified test conditions. NFPA (National Fire Protection Association): The stated mission of the NFPA is to reduce the worldwide burden of fire and other hazards on the quality of life by providing and advocating consensus codes and standards, research, training and education. OSHA (Occupational Safety and Health Administration): Congress created OSHA with the Occupational Safety and Health Act of 1970 to ensure safe and healthful working conditions for working men and women by setting and enforcing standards and by providing training, outreach, education and assistance.